C.C.E., Inc is a privately owned and operated company founded in 1997 by Jeff Eastridge who has built C.C.E. into a multifaceted company. We fully compliment contractors and residents by providing; Site clearing, Excavation, Roll Off Dumpsters, Demolition Services, Trucking, and Tire Recycling services. We provide invaluable service to the community. C.C.E., Inc offers the most affordable roll off dumpster rentals in the Louisville, Kentucky and the Southern Indiana area and beyond. We are innovators who care about serving our customer's needs efficiently and cost effectively. We have over 20 years experience in the demolition industry. From tight demo’s to large commercial buildings - C.C.E has done it all. From removing the Kingfish to make way for the new Louisville Ali Center, to selective interior demolition of Louisville's Radio One Building on 4th Street - allowing the architectural integrity of the building to remain, to removing an entire block to make way for the New Albany YMCA. We build relationships with all of our clients and offer them the best customer service possible in the industry. From large-scale remodels to landscaping projects, new construction, or just removal of bulky items - a commercial or residential roll-off dumpster rental from C.C.E., Inc is the simple, reliable solution you can count on. Renting a C.C.E. roll-off dumpster is easy and efficient with a wide variety of solutions and service. We offer solutions for every project from small renovations to large construction sites while providing prompt, careful delivery, and removal of your dumpster. The 30 yard dumpster can hold a maximum of four tons of trash and can not be loaded above the sides. There are additional charges for loading the dumpster over the allotted four tons of $35/ton. This dumpster is great for garage and barn clean outs or room renovations. Also, good for yard waste cleanup and projects. The 40 yard dumpster can hold a maximum of six tons of trash and can not be loaded above the sides. There are additional charges for loading over the allotted six tons of $35/ton. Our normal rental periods are 10 days with additional charges after 10 days of $5/day. If you know you are going to have the dumpster longer than 10 days, let us know and we can make plans accordingly. The 40 yard is the largest dumpster you can rent. It is perfect for complete home remodels or new construction. This size is normally used for commercial or business use, but can also be used for residential. 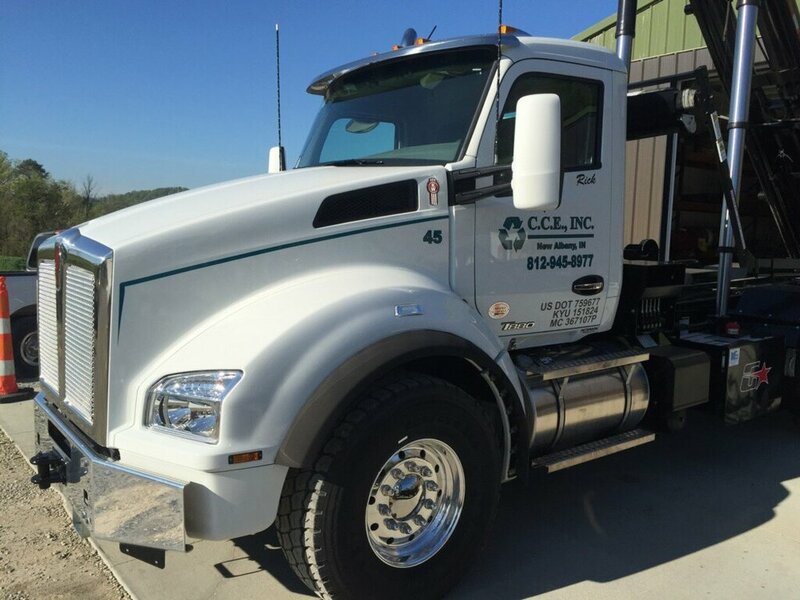 C.C.E., Inc. will move heavy or awkward equipment and machinery with our flatbed and heavy haul trucks. If you have heavy duty equipment that you need transported anywhere locally, we can transport it with our flatbed trucks. We specialize in equipment moving, local hauling, flatbeds, lowboys, van trailers, walking floors, dump trailers, landoll, and more. The team at C.C.E. are dedicated to an effective working relationship with our clients from start to finish of the trucking process. If you’re looking for a complete, cost-effective solution for moving heavy machinery, etc. - C.C.E has the capabilities to get the job done in optimal time. Contact us today by calling (812) 945-8977 to learn more about our trucking services and to find out how we move what others can’t. With over 30 years experience, C.C.E., Inc has the ability to perform a variety of services for the demolition removal of industrial and commercial structures. We have a proven track record of meeting challenging deadlines while maintaining a safe work environment. We specialize in various types of demolition and understand that each client has its own needs and requirements. In addition, C.C.E. can provide services such as demolition of warehouses, shopping centers, office buildings, and much more. We have performed large commercial and industrial projects ranging in value and including demolition prep for the Ali Center in Louisville, New Albany YMCA, Lanesville High School, New Albany Parking Garage, selective interior demolition of Louisville's Radio One building on 4th Street, and more. We make every attempt to ensure that your project is done to your specifications, and within your budget - all while meeting your timeline. Our goal on every project is to provide the highest quality of service, while maintaining safety and providing our client the ability to quickly return their property back to productive use. When you have new construction plans, have acquired new land that needs clearing or excavation, or are in need of demolition of a property structure - contact C.C.E. Inc. for an estimate on our complete site clearing and excavating services. As a BBB+ Accredited Business since 2003, as well as a licensed and insured company with state-of-the-art equipment, you can depend on C.C.E. for a smooth running project and a professional job from the start to the final grading. Our team and equipment are fully insured and can handle any commercial and residential site clearing & excavation project. Old, unused tires are unsightly and difficult to get rid of. Most trash collectors refuse to pick them up with your other garbage because of the overwhelming demand. Over six million tires are disposed of annually in Indiana alone and millions of tires are illegally disposed of and wait remediation. Tire piles cause serious health threats to humans by providing breeding grounds for mosquitoes etc. C.C.E. provides organized weekly, monthly, on-call pick ups, and even customer drop off services to the community. Semi trailers are available for larger customers. For a quote, call us today (812) 945-8977 for responsible tire disposal services. Thank you for contacting C.C.E. Inc! We’ll be in touch shortly.